NBC Sports Network (NBCSN) is an U.S.-based channel that offers a variety of sports-centered broadcasts, including disciplines such as football, soccer, hockey, baseball, golf, cycling , tennis, rugby and major events such as the Olympic Games. 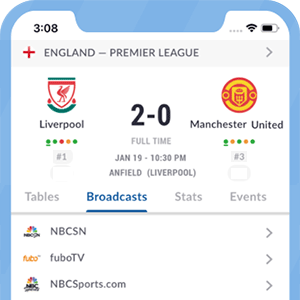 NBCSN is available on most cable and satellite TV providers in the U.S., with the added bonus of watching their content online via the network's apps and website. In order to access all content via its website, NBCSN users will need a username and password, which will be supplied by their pay-TV company. All shows and games will be available both live and on-demand. Since its launch in 2013, this channel has broadcast some of the best domestic leagues in Europe, such as the English Premier League. Added to that, NBCSN owns broadcasting rights for all FIFA tournaments, including the FIFA World Cup, until the end of a deal that extends to the year 2026. What channel is NBCSN on? Available on other U.S. cable and TV	providers. Check your local TV provider or program listings source for channel availability. *Got itLive Soccer TV does not provide NBCSN live streaming. The information provided on this page is simply NBCSN soccer TV schedule.